Ryan Tate - The Hack: Someone made Flickr for your MP3s! So a few weeks ago I publicly yearned for a personal online MP3 locker -- basically Flickr for your music files. I even reserved tunesr.com. 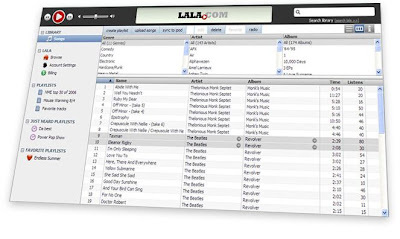 Well, last night Arvin Dang posted in the comments a pointer to LaLa.com that looks almost exactly like what I wanted -- basically the look and feel of iTunes on the Web.